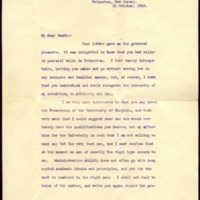 Woodrow Wilson thanks Richard Heath Dabney for his attendance at Wilson’s inauguration as President of Princeton University and discusses the University of Virginia presidency. Your letter gave me the greatest pleasure. It is delightful to know that you had enjoyed yourself while in Princeton. I felt fairly inhospitable, letting you come and go without seeing you in any intimate and familiar manner, but, of course, I knew that you understood and would recognize the necessity of my submitting to publicity all day.I am very much interested in what you say about the Presidency of the University of Virginia, and wish very much that I could suggest some man who would certainly have the qualifications you desire; but my affection for the University is such that I am not willing to name any but the very best man, and I must confess that at the moment no man of exactly the right type occurs to me. Administrative ability does not often go with deep rooted academic ideals and principles, and yet the two must be combined in the right man. I shall not fail to think of the matter, and write you again should the proper suggestion come to me. I will forward the engraved address to you today for Dr. Barringer's signature. Wilson, Woodrow, 1856-1924, “Woodrow Wilson to Richard Heath Dabney,” 1902 October 31, WWP20450, University of Virginia Woodrow Wilson Letters, Woodrow Wilson Presidential Library & Museum, Staunton, Virginia.